A high security extreme cross cut shredder. The paper feed width of 400mm and a powerful 1650 watt motor makes this machine the right tool for destroying both paper and computer print outs at high speed and at high security. The cabinet is made from solid wood, the top cover from virtually unbreakable plastic material. The manual start-/stop-function and reverse-function guarantee easy handling. The motor cuts out automatically when the front door is opened and the waste box is full. This model is easy to move around thanks to four fitted castors. Comes complete with 10 spare waste bags and a single tier feed rack. 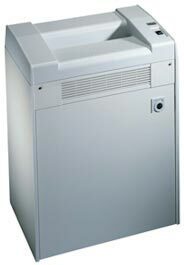 This Dahle shredder comes with a 5 year warranty against cutter fracture and a 2 year function warranty.